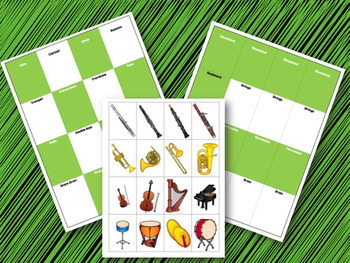 Featuring sixteen instruments of the orchestra, this set of instrument picture cards and two sorting mats are great for music centers or small group practice. 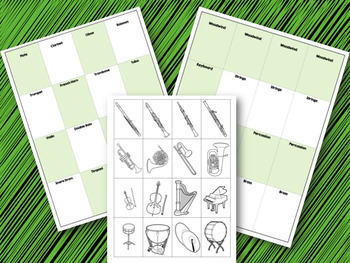 Task cards with simple directions guide students to sort instrument picture cards by name or by instrument family. Answer sheets allow for self-checking and correction. High-color and low-color options are provided for each page. 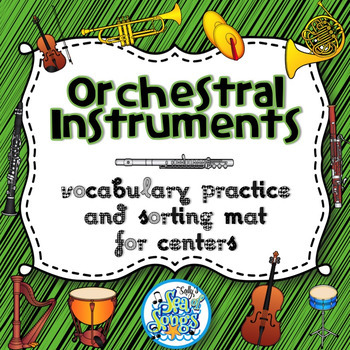 Instruments included are flute, clarinet, oboe, bassoon, trumpet, trombone, French horn, tuba, violin, double bass, harp, piano, snare drum, bass drum, timpani, and cymbals. 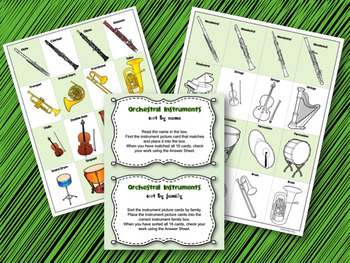 Please note that viola and cello are NOT included because the small size of the picture cards make it difficult to differentiate when all pictures are the same size.